We tailor each Vistage private advisory group to ensure that each member get the maximum benefit possible. We have specific groups for CEOs/MDs running larger SME business (typically £3-£50m); executives running smaller businesses (typically £1-3m); key executives who report to a CEO/MD; and for organisations that wish to bring Vistage inside their organisation for all their senior management team. Successful leaders combine good business sense with inspiration, guidance and unwavering authority. The Vistage Chief Executive Program creates a unique environment that provides each member with individual insight, coaching, strategies and leadership skills to help you make better decisions and achieve better results for your company. Connect with up to 16 peers from a diverse range of non-competitive businesses and backgrounds in this one-of-a-kind peer advisory and executive leadership development program. Harness the power of a group of fellow executives all driven to do the best for themselves and their peers. 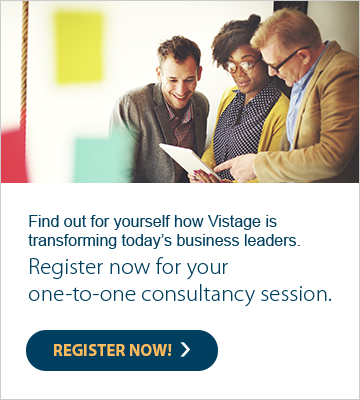 Designed specifically for business leaders running smaller businesses, Vistage provides you with insights, strategies and leadership development you need to achieve better results and fast-track your growing company. Imagine the power of leveraging the experience of other small business leaders with a diverse range of industries and backgrounds in a private and intimate setting. No fluff, just real issues and real results. Who holds you to account? Who helps you make better-informed business decisions? Who helps deliver new innovative ideas? Who challenges you? Who keeps you on track for growth and success? It’s hard to lead. A Vistage Small Business Group helps you grow the business you’ve always wanted. Designed to help results-driven key executives build leadership skills and bring new thinking, new ideas and new strategies to the table. The Vistage Key Executive Program empowers you to become a stronger asset to your CEO and team. Benefit from sharing a peer perspective, expert insights and executive coaching to give you the knowledge, strategic thinking and confidence you need for the fast-changing business environment of today’s modern organisation. Vistage Inside goes beyond off-the-shelf management training by tailoring a programme specifically formatted to address your organisation’s most pressing issues. Your leadership team will identify challenges as a group and devise their own solutions, fostering a greater sense of ownership, collaboration, commitment to action and achieve bottom line results. Vistage will tailor each of its elements to provide a unique blend of expert speakers, group issue processing, one to one coaching and internal private advisory groups comprised entirely of your own staff. Delivered at your premises and at a frequency to suit your business.